Last week, 16 high school teams from around the world gathered in Calvert, Queensland to put their unmanned aerial vehicle (UAV) skills to the test and save Outback Joe at the ninth annual UAV Challenge. Yet again, our hapless mannequin Outback Joe found himself lost and in desperate need of assistance from the world’s top UAV teams. This year he really got himself into a jam. Joe got himself lost, cut off by floodwaters and, to make matters worse, he made an “emergency call” to advise that he was suffering an allergic reaction and needed urgent medical assistance. Yet another unfortunate predicament for our inanimate friend. To save Outback Joe each team was tasked with designing and developing their own UAV (a.k.a flying robot or drone) plus the software and hardware necessary to complete the mission. The teams then needed to manoeuvre their UAV past two overhead hurdles and deliver an EpiPen payload (to assist with Joe’s allergic reaction, of course) safely, and as close to the stricken mannequin as possible. This could either be deployed remotely by the team’s mission manager (the team member responsible for delivering the EpiPen) or autonomously by systems on board the aircraft such as a camera, a GPS system, or even through the use of ultrasonic sensors. The EpiPen then needed to land safely and intact with a shock measurement under 75G. On top of all this, there’s a twist! While the pilot flying the aircraft has a visual on Outback Joe, the mission manager was placed in a completely closed off room with no visual of Outback Joe, their teammates, or the aircraft during the flight. This additional obstacle not only called for the use of quality technology but top-notch teamwork as well. A dark and brooding Queensland sky did not dampen the competitors’ desire to find Outback Joe. It was a battle hard fought by all of the spirited teams, but in the end it was the local heroes of team Double Duo from the MUROC Flying Club at Mueller College, Queensland who prevailed through the storm and interference to take home the $5,000 grand prize and rescue Outback Joe in the 2015 Airborne Delivery Challenge. The Double Duo team were one of the only teams to successfully drop and land three packages with a shock reading under 75G. Meeting the shock measurement of 75G and keeping the EpiPen intact proved to be one of the greatest challenges for all the teams. The contest was extremely tight with only one point dividing the winners Double Duo and runner-up team Par Hexellence, who received a majority of their flying points by impressively, autonomously dropping their EpiPen payload. In a post-event interview on 612 ABC Brisbane radio, Double Duo team captain Michael Phillips discussed attitudes towards drones, how this event showcases the positive aspects and advantages of UAV technology, and how it can be applied to a range of scenarios to help us in the future. We’re sure if Joe could talk and articulate his limbs and digits he would agree and give a big thumbs up. A big congratulations to all the teams for the great spirit in which they competed and the event sponsors for their continued support. The UAV Challenge is joint initiative between Queensland University of Technology and Data61 – take a look at our robotics and autonomous systems research page for more information. Income inequality is undoubtedly one of the most controversial economic issues of modern societies, with many countries facing incredible differences between those who make more and those who make less. But what is happening across Australian regions? Although researchers such as Peter Whiteford and Nicholas Biddle have investigated the issue in Australia, there are no official records on income inequality measured consistently across regions of the country – even at national level income inequality measures are rarely available in international comparisons (see for instance, World Bank and OECD data. This lack of evidence is a clear reflection that income inequality is less conflicted in Australia compared to other countries, as Australia is characterised as having very low rates of poverty and economic segregation, compared to other societies, and a culture of “a fair go”. However, regardless of the apparent “economic equality” in our society, income inequality is still an important issue to track and analyse. In order to fill the gap on income inequality measures across the country, we have developed a method to approximate Gini coefficients for different Australian regions, including states and local councils. At state level, based on our estimates in 2011, the most unequal jurisdiction was NSW (0.42), followed by the Northern Territory (0.40), while the least unequal was Tasmania (0.38), meaning that the gap between the rich and the poor was bigger in NSW than in Tasmania. However, income distribution varies over time, with the ACT showing the biggest change in income inequality, where the Gini coefficient increased from 0.35 in 2001 to 0.39 in 2011. At sub-state level, within metropolitan areas, we found that the local councils of Burwood, Strathfield, Kogarah and Sydney (all from the Sydney Metropolitan area) had the highest income inequality in the country in 2011, while the local councils of Melton (in Melbourne), Light (in Brisbane), Mallala (in Perth) and Palmerstone (in Darwin) had the lowest income inequality. Click the image for an interactive map highlighting the Gini coefficient across the country. In terms of trends in cities, interestingly Perth captured both extremes: while the suburbs of Cottesloe and Subiaco is where income inequality has increased the most, the local council of Perth had the lowest increase in inequality across Australian cities. The Gini is one of the most used indicators for income inequality across the world for its simplicity: a Gini of 0 means that the total income of the region is distributed evenly across all persons of the region, while a Gini of 1 means all income captured by just one person. According to the OECD, in 2012 Australia had a Gini of 0.326, while the US had a Gini of 0.390. 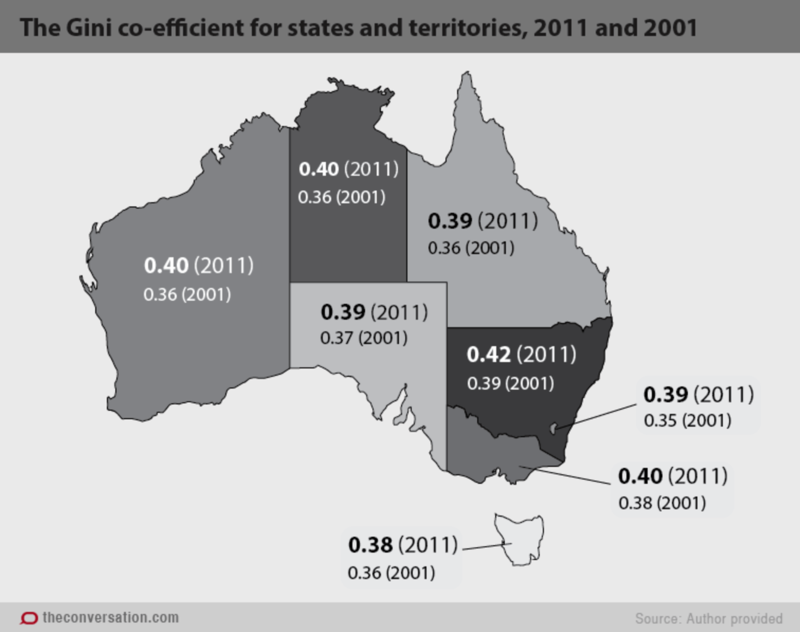 Thus, in order to provide more insights about the effects of the mining boom of the recent decade across Australian regions, we have constructed Gini coefficients for family income reported in the national censuses of 2001 and 2011, across all regions of the country (see our published paper here. Although our measures are not perfect and are subject to some assumptions, including the assumption that 30% of families in the richest income bracket capture 70% of the income in that segment (see the assumptions used and estimation steps here), they do provide a good sign of how income inequality varies across the country and how it has been changing over time. All Gini coefficients across regions are available here. These income inequality data raise several questions. Are the reasons for income inequality different around the country? Does income inequality affect other factors such as health, as evidenced in the US? 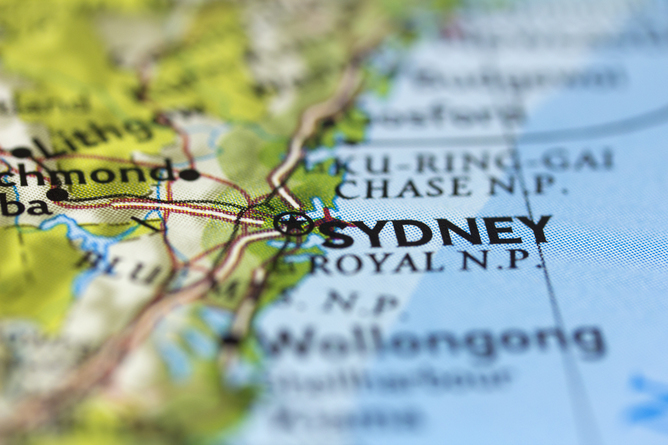 What levels of income inequality are acceptable across Australian regions? And what actions are required to address this? These are the questions policy makers should now tackle. Have you ever been to a gallery or museum exhibition where only the front of a sculpture or ornament is visible in the display cabinet? Perhaps there is a dawdling family of six, gawking at the intricacies of the 2nd Century Roman bust. Maybe it’s a gaggle of slow moving art students analysing every crevice of a Greek vase. Regardless, it can be a frustrating experience for the curious inquisitor. Firstly, getting a close-up vantage point amongst the crowd for an uninterrupted view, then that awkward moment when you peer in on such an angle that your head hits the glass. What if you could explore the item with your fingertips from every angle in life-size scale? Wouldn’t it be something to view the inside of a crown of jewels or an extinct specimen from every point of view? We’ve joined forces with the National Gallery of Australia (NGA) to create a new way for visitors to interact with the artefacts currently on show in the Myth + Magic: Art of the Sepik River, Papua New Guinea exhibition; showcasing the intricate sculptural art of the Sepik River region. The art of the region uses many different materials including: timber, pig tusks, feathers, shells, bone, hair, teeth, fur, and clay. It is often because of the age, fragility, and pricelessness of these materials that we are required to stand behind red rope and glass to appreciate and explore the relics. To overcome this issue our Data61 research team, in collaboration with the National Biological Research Collections and the Atlas of Living Australia, developed a new 3D content deployment platform using open web standards to transform the physical exhibits into fully interactive digital sculptures. Visitors can interact with the touch screen and view the artwork close-up, from the bottom or the back, and learn more about the intricate details and the culturally significant features: like symbols and materials. Of course the digital version won’t replace seeing the real thing, but the additional information will complement and enhance the experience. This technology isn’t entirely new. We have used 3D scanning capabilities to great affect with InsectScan, a way for researchers to easily capture digital 3D models of tiny insect specimens in full colour and high-definition. Building on this existing technology for the NGA’s Myth + Magic: Art of the Sepik River, Papua New Guinea exhibit is one way we are improving and tailoring our work for other organisations and institutions. The NGA is just the most recent example of our work with the Galleries, Libraries, Archives and Museums (GLAM) sector, and we have been working with a number of organisations to embrace digital innovation. Science is often the inspiration for art, from van Gogh’s Starry Night to the physiological sketches of da Vinci’s Vitruvian Man, so we’re excited to continue that tradition and build on this symbiosis of disciplines and extend the understanding of art in microscopic detail through advances in digitisation technology. So, if you’re in Canberra before 1 November, make sure you head down to the NGA to check out the Myth + Magic: Art of the Sepik River, Papua New Guinea exhibition and let us know what you think of the real and digital artworks in the comments below. Data is everywhere. It’s being collected every second of every day, across billions of devices all around the world. And you will often hear that collecting all that data will make us more efficient, that data will change our lives, that it will tuck us in at night and do all our chores. Well, we wish collecting data meant no more dishes, but at the moment we’re dealing with a far larger problem: we have too much useful data and not all of it is going to good use. That’s why the annual GovHack competition is such a terrific concept. Organisations (like us) from across Australia and New Zealand provide large swathes of information for the assembled hackers, who dutifully put on their thinking caps and create something fun, interesting, and worthwhile. Back in early July, teams battled it out over three days to create and develop more than 400 projects for GovHack 2015 across 40+ categories. We ran two categories ourselves – Best Science Hack (co-sponsored with Geoscience Australia) and the CSIRO Bounty Prize, which attracted 70 impressive entries. After weeks of careful deliberation the GovHack winners were announced at a ceremony in Sydney on Saturday night. Amongst the impressive hacks were an array of mind-boggling entries which wowed the crowds: a video game that lets you explore a topographically accurate Canberra, an app that helps you discover the mood of trees, and a mobile app to help people identify Australian wildlife. There were too many to mention, but here’s three of our favourites. Minecraft is the darling of the educational video game movement. The game combines resourcing, geometry, resource and project management into an incredibly enjoyable educational game, an educational game that kids actually want to play. Canberra-based developers, Mind the App, thought they could use this mega successful game to create a fully explorable and accurate topological map of Canberra within Minecraft. The result – pulled together using our data alongside some of Geoscience Australia’s – is very impressive. Keep an eye out for the incredibly realistic representation of pollies strolling through the halls of power. By importing this information into the Minecraft video game, the “hackers” have made geospatial data more approachable and more enjoyable to explore. If you have Minecraft and you want to have a go, you can download the map and soar across the nation’s capital in all of its blocky glory. Have you ever stopped to think about the amazing amount of biodiversity around you? Wouldn’t it be great if we could just ask someone: “What plants and animals are in my area right now”? Well the winner of the CSIRO Bounty award, FieldGuideAU, may have the perfect solution. They set up a system which lets you query a range of sources to find the answer, using one simple tweet. Send a tweet with your location to @FieldGuideAU and a list of common plants and animals nearby will be tweeted back to you faster than you can say ‘Common Eastern Froglet’. So far we have focused on projects that reimagine data as a useful app or a video game. But the Torange Juice team take a different approach with their hack ‘Ecovalia’. They’ve turned information from the South Australian Department of Environment, Water and Natural Resources, and our ever popular Atlas of Living Australia, and created a physical print-and-play, table-top card game. This isn’t Snap, Solitaire or Magic: The Gathering. The game casts the player in the role of park custodian, encouraging participants to manage the development and conservation of South Australia’s reserves and national parks.